The Emerald Code Show – Get With The Programming! Browse: Home → The Emerald Code Show – Get With The Programming! I am a big fan of cheesy 80s horror. I know, not quite the introduction you would expect from me. But hey, those types of movies are incredibly formulaic. Like an algorithm. Right?? I see the world in algorithms. I think Papert would consider this a twist on his Mathland theory. I was browsing Netflix over the Winter Break and came across a nice Canadian gem called Slasher. It does a great job of paying tribute to the genre ala Canadian fashion. Two seasons are currently out and we totally did the binge watching thing over the holidays. My wife and I love to IMBD-trivia each other and this show gave us a great opportunity. At first, we wondered whether the show was Canadian, followed by where it was filmed. After some formal research, we landed at Shaftesbury. My Canadian friends will recognize this amazing company from their long time, award winning show, Murdoch Mysteries on CBC. One of my favourite Murdoch episodes was about William Peyton Hubbard, my great great great grandfather, who was the first African decent elected to office in Canada! My little claim to fame! But this post isn’t about Slasher or even Murdoch Mysteries. My obsession with TV and movie trivia ala IMDB set me on course to find Emerald Code. Now do you see my train of thought on this post? Simone’s always making things to bring her fun ideas and crazy plans to life. Why not send candy to the whole school by drones, or 3-D print your science assignment? When Simone and her friends, Type-A musician and star student Lana, uber-energetic gaming enthusiast Bevan, and class cutup Jackson, ‘King Of The Meme’—aren’t hanging out in Rowat High School’s MakerSpace, they’re in constant contact on their video chat, ‘Konnect’, in a never-ending group hang. Together, they solve high school problems, make each other laugh – and crack the Emerald Code! WHAT?!?! A web series dedicated to engaging middle school kids in Compute Science?? AND Canadian nonetheless! Season 1 is currently available on the website here. OK, this is AMAZING. Each episode is 3-5 minutes in length providing the perfect “hook” to your lesson or classroom task. Immediately I recognize opportunities to get my students to write – summarize, recount or explain what is happening in the episode. The math entry points are obvious, as are the coding slots. But, perhaps most important, we have young people acting as role models for students. The show has a plot, it isn’t just about coding. 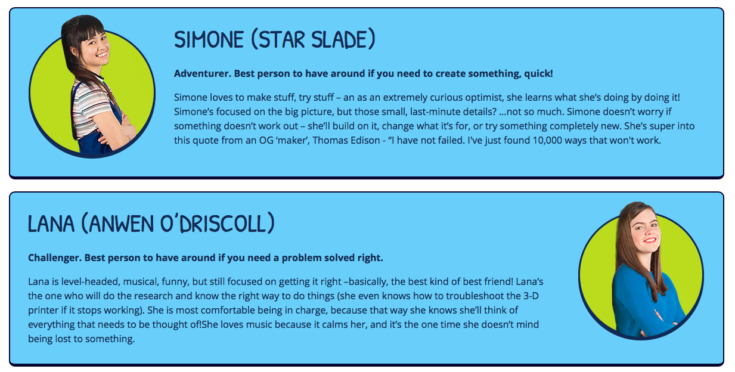 The “Emerald Code: Decoded” section features real life students doing real life STEM projects! I have just followed the show on twitter. Season 1 is brand new having been released this last fall. I am definitely adding this to my list of resources to share at conferences and workshops.